At least two saws will be needed. If you already have a hand saw (see illustration below - top), it can be used for working with wood. 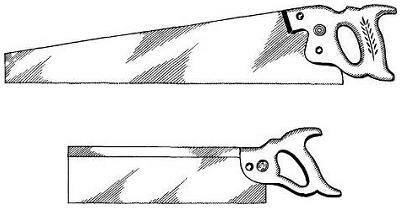 Since most lures are small, however, a back saw (see illustration below - bottom) which has a thin blade and fine teeth is even better than a large hand saw with coarse teeth for accurate cutting. The other saw which is needed is a hacksaw (see illustration below) that is used for cutting metal and other hard materials such as plastics. There are many types of hacksaws on the market, but the adjustable frame with a pistol grip is best. You will also need several kinds of blades to use with the hacksaw. These blades have from 14 to 32 teeth to the inch and come in all-hard or flexible tempers. Each type is best for a certain job, depending on the metal or material you are cutting. If you have one or two blades of each kind you'll be prepared for any cutting job.